This software allows you to connect a USB midi device to one of our USB Host boards (or IC's) for 2-way communication using the MIDI protocol. It translates the USB MIDI data packets to/from Serial data packets at the MIDI baud rate of 31250. This is a free software download for our USB Host Boards and USB Host IC's (SOIC, DIP, SSOP). To order, simply select which of our boards or IC products you wish to have the software loaded onto. See the USB Host Board and IC product pages for details on pricing and installing this software. 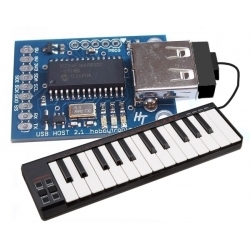 With this software on one of our USB Host devices you can now communicate with USB MIDI devices using Arduino / Teensy / Raspberry Pi and many other microcontroller boards using the standard MIDI message format. Use your USB MIDI device without having to connect it to a computer. Standard MIDI compliant devices are supported. Some Complex MIDI devices use a built-in USB Hub. These MIDI devices are not supported and will NOT work with our USB Host Boards. You can determine if your device has a built-in hub by running the free Windows program USB Tree Viewer. If, when you plug in your MIDI device it appears as a new Hub plus one or more devices then it will not work. The USB MIDI device must be connected directly to the USB Host, it cannot be connected through a USB Hub. [NEW] - As of V1.18 command mode is now inactive by default. The reason is that if you have the board connected to MIDI IN and OUT but no USB MIDI device attached, then serial MIDI data received would be echoed back out on MIDI OUT. So, in order to get into command mode you must do the following..
2. Send two consecutive dollar characters "$$" in the first 10 bytes of serial data. If $$ is not received within the first 10 bytes, a reboot is needed to try command mode again. The following Commands are available. Connect the board/chip to a suitable serial connection at 31250 BAUD and a Terminal program. The Help screen and configuration settings can only be made when there is no MIDI device attached. The DEVICE indicator when turned ON will set the SS pin HIGH when a MIDI device is attached and LOW when removed. This is useful if connecting the board to another microcontroller as it indicates if a MIDI device is attached. Because the DEVICE option and CHANNEL option use the same SS pin, only one option can be activated. The FILTER option allows you to block ALL incoming MIDI channel data received on the serial RX pin EXCEPT for the MIDI channel selected. Temporarily turns on debug output. This is useful if you have a USB MIDI device that is not working. The debug output can be sent to us at Hobbytronics to determine the problem. No configuration needs to be done for normal operation. However, we have added the option to be able to override the outgoing MIDI Channel number. By default this is turned off. This is a very useful feature when connected to a device like the WAV Trigger as it can be used to switch between different set of WAV files - effectively switching instruments. The channel number is set using the unused pins on the board. This can be done using a BCD Rotary Switch. If using the CHANNEL override function, the channel number pins should either be connected to +3.3V or to GND. They should not be left floating. To upload the Software to the USB Host Board you will need to use the ds30Loader program. See the USB Host Board product page for more information on this.